The slightly oversized Cassandra clutch is a great accessory for semi-casual to cocktail attire this winter. With its snakeskin printed leather and slim design, this bag is right on trend for the season. The finish on the leather is impeccably detailed, which I would expect from Hobo International as well as other brands whose clutch bags retail for over $100. While the back of the bag might be flat, the front has been given some visual interest and depth with soft pleating that relaxes the look of the clutch but also makes it contemporary. Because of the width of the Cassandra Holiday clutch, there's not an impractical lack of space inside as with some purely decorative clutches. Though it might not be quite as versatile as other clutch designs from the brand, this Hobo International bag will take you plenty of places whether during the holidays or not. 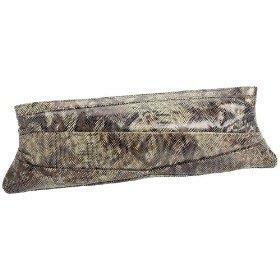 The Big Buddha Eclipse Clutch, a great alternative to this snake printed clutch.